Fuyuko Toyota is a certified iRest Yoga Nidra® Senior Trainer, Retreat Leader and Supervisor / Mentor. For the past 20 years she has been deeply committed on the path of Yoga and ancient Non-Dual wisdom. She has been teaching since 1996. She incorporates iRest and Self-Inquiry in her teachings of Yoga, somatic body awareness and meditation at her Yoga studio, Prema Yoga, on the Gold Coast, Australia and internationally. In 2007, Richard Miller, her spiritual mentor, brought to Fuyuko a deeper understanding of living life in a Non-Dual way, in harmony with all of life. From a life of ever deepening joy, astonishment and Stillness, a heartfelt desire to share these precious teachings has sprung forth. She teaches and hosts iRest trainings and retreats in Australia. She has been assisting iRest trainings in North America for Richard Miller and other senior trainers. She offers individual, small group classes, corporate yoga, restorative yoga, fundamental courses, workshops, simple meditation and yoga nidra called iRest (Integrative Restoration) for restoration and deep inner inquiry. Fuyuko has attended many of Donna Farhi’s workshops over the last ten years and completed her Advanced Teacher Training in 2005. In addition, Fuyuko has assisted Donna on her 150-hour Advanced Teacher Training in 2010 and 2012. 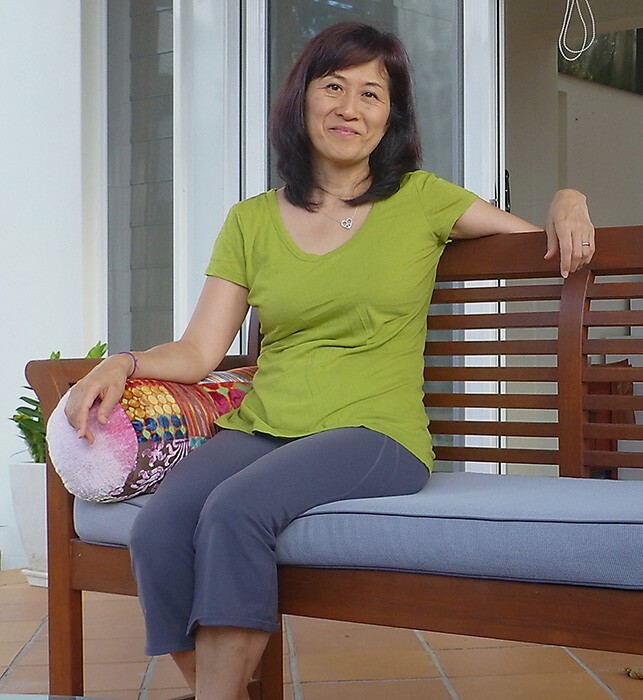 Donna Farhi’s authentic approach to Yogic teaching has influenced Fuyuko’s yogic practice and approach to life. Her teaching emphasises on body & breath awareness and movement principles applied in a safe comprehensive way. She encourages students to find the inner teacher within and develop deep communion with their body, mind and spirit. Fuyuko truly enjoys living life with iRest and Yoga, and wishes to share her love of all that is flowing out of her heart. She guides her students along the Yogic path to discover truly who we are, and guides us back home, to our True Nature. My name is Anne and I’m a 72 year old woman, working and living on Queensland’s Gold Coast. I’ve been attending Yoga Nidra/iRest classes at Prema Yoga Studio for three years, and can guarantee it has been, and continues to be, of the greatest non-medical benefit to my mind and body that you could imagine. Fuyuko, teacher/guide for all levels of skill and interest, has gently brought me to a place in my mind where I can now use the techniques of iRest in my everyday life, in all circumstances. Recently I underwent major surgery and was delighted to feel nothing but peace and tranquility pre and post operation. By using the very simple and easy strategies of iRest, I was able to prepare my mind and body for the trauma of surgery, and enjoy the surprise and delight of nursing staff at my positive attitude, lack of pain and speedy recovery. Before Yoga Nidra/iRest, this would not have been the case. Yoga Nidra/iRest is for every age, and every stage in life. Men and women, young and old, can all benefit from the simple techniques that are loving given by Prema Yoga Studio. My eternal thanks to Fuyuko and the wonderful friends I have made there.